Japanese Episode AG 018: "Hagi-Roujin to Kyamome no Piiko-chan!" American Episode 290: "On a Wingull and a Prayer!" Satoshi-tachi are looking for a ferry to the next Gym Battle, but unfortunately for them they've ended up in the wrong section of town. Haruka volunteers to find a ride to Muro Town, and in her search she meets a man named Hagi. The old man, who owns a Kyamome named Piiko-chan, agrees to take Haruka-tachi to the next island, so the young trainer hurriedly meets back up with her friends to tell them the good news. 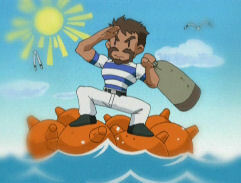 Meanwhile, a member of the Aqua-Dan appears and kidnaps Piiko, threatening to harm it unless he is allowed to use Hagi's boat. Haruka returns to Hagi's house with her friends, but the old man disavows any knowledge of a prior meeting. Haruka is confused until Takeshi and Masato figure out that Hagi was behaving strangely because the Aqua-Dan agent will need his boat to rendez-vous with the rest of the gang. Satoshi-tachi go back to Hagi's house to rescue the old man, but an interruption from the Rocket-Dan allows the Aqua-Dan member (who turns out to be the same thief from the Devon Corporation) to escape. Hagi reveals that he has another, faster boat, and soon a chase ensues. Despite everyone's best efforts, the Aqua-Dan member is able to meet back with his friends and escapes in a giant sub. However, they did manage to rescue Piiko, and as everyone celebrates, Hagi agrees once again to take everyone to Muro Town. Continuing in a streak of non-filler episodes, we see Satoshi-tachi's efforts to get a ride from Kanazumi City to Muro Town. It's pretty much the exact same thing you do in the game, and I think it's great that they put Hagi into the anime. I also like that they made a Haruka-centered episode, especially after so many Masato-centered episodes. Nothing too special to report on the dub front. 4Kids gave Old Man Briney the exact voice I figured they would, and I think this "Old Man Voice" is tied with the Richie voice for the most overused voice in the series. 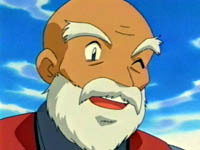 Is there really nobody in 4Kids group of voice actors who can do a different old man voice? And Kyamome didn't keep its Japanese voice, despite the fact that it kept it at the end of "Hoenn Alone." I'm not very optimistic about any of the Houen pokemon keeping their Japanese voices at this point. A second is cut from the very first shot of the episode. It's been a while since 4Kids has had a strange Japanese pun to work around. While Hagi is telling Haruka about his past, he tells Haruka about how he had a military position (bui bui) as he rode the seven seas (nanatsu no umi). Haruka misheard nanatsu no ("the seven") and bui bui ("military position"), and so when she recalled the story to Satoshi-tachi, she told them that he rode on "nanatsu no bui" (seven buoys). That's why, in the accompanying picture, he is riding on seven buoys. In the dub, they have May's mishear "seven seas" and "quake in your wake," producing "...he traveled the seven sails in his quaking ship and stayed awake the whole time." It's the same type of mistake, only with different words because of the language difference. A second is cut from the scene right before the final commercial break. Three seconds are cut from the pan of Hagi's house right after the final commercial break. And two seconds were cut from the end of the TO BE CONTINUED... screen.